Canadian artist Paul Roorda's work uses non-traditional materials to explore the relationship between ritual, medicine and the changing role of religious practice in society. The unexpected juxtaposition of media culled from both sacristy and apothecary shelves offers a profound commentary on the concept of healing. In his Antidote, Bible pages are rolled into scrolls or individually burned before sealing them in vaccine vials. 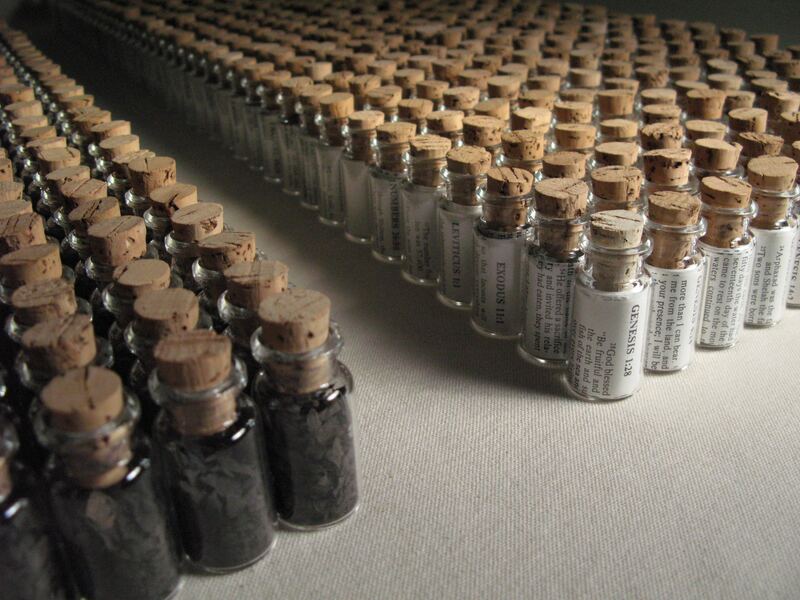 On the right, 475 vials arranged in 25 rows, meticulously ordered from Genesis to Revelation. 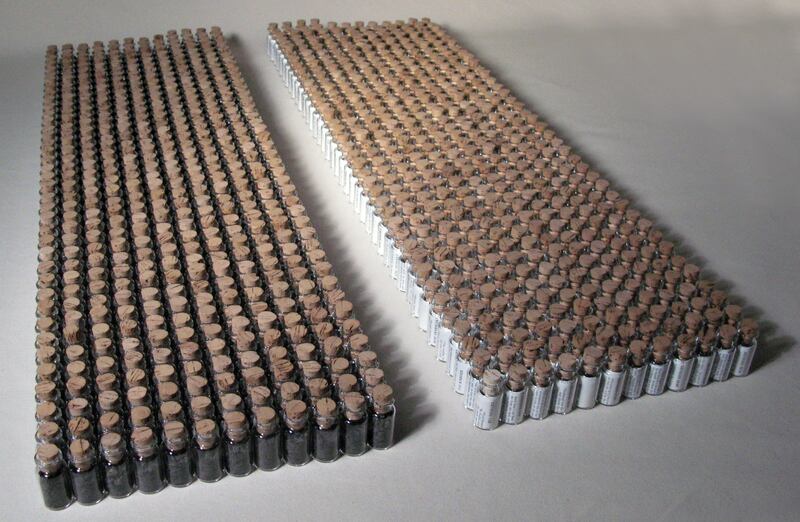 On the left, 475 matching vials of scorched biblical text. An antidote, by definition, is a remedy that counteracts the effects of a toxin or poison. The bottled biblical text suggests an antidote in the spiritual sense. One interpretation of the work is to consider the poison as sin, a deadly venom that is eating away at our bodies and our souls. Redemption in this reading may evoke the long Christian tradition of Jesus consuming the poison of death and sin so that we may drink his blood in the Eucharist as an antidote. The cup of which Jesus speaks in Gethsemane was ultimately a healing medicine for mankind but at the same time was to him a deadly poison. It is common, for example, to see the infant Christ holding a poisonous apple in Gothic statuary as a reference to both original sin and the sacrificial liberation in which the effects of the poison are counteracted. When I exhibited this artwork at a small, largely Protestant, liberal arts Christian University, I listened to students as they reflected on this piece. For many of them, this work mirrored the callowness of their own faith journeys – a didactic statement about sin (vials full of burnt text) and remedy (Jesus). I reminded them that the artist was dealing with pieces of biblical text on both the left and right of the sculpture and it may be presumptuous to consider the preserved text to be the antidote in this equation. Good art, I reminded them, often challenges and complicates easy readings. In Greek, I pointed out, the term pharmacon (from which we get the word pharmacy) can mean both medicine and poison. For me, this sculpture suggests another biblical story about poison. In the book of Numbers we read about the bronze serpent that Moses put upon a pole. Those suffering from poisonous snake bites could be healed by looking upon it, and later, in the Gospel of John, Jesus compared himself to this image. But the story of the snake is not confined to this simple parallel. In 2nd Kings we learn that the covenant people, decades after the reign of David and Solomon, began to deify the bronze snake as the carrier of life. Though they kept to the script of their religion by following the precedent of serpent-gazing, the symbol was lifted from its original context to become a fetish. By mechanically following the letter of the written text they missed the message and the spirit of this symbol. The biblical account goes on to tell us that king Hezekiah wisely recognized the changing role of the Nehushtan and ordered its destruction. I must confess to feeling a Hezekiah-moment when I overheard students talking about the potential “blasphemy” of artist Roorda burning pages of the Bible in this artwork. Within many Protestant traditions (Roorda grew up in the Dutch Reformed tradition) the Bible itself is regarded as an object of power. The repetition of terms like inerrancy and infallibility can create the impression that each text, each passage, chapter or verse, has as a single, fixed, objective, and determined meaning for all places and all times. Removed from the bigger story, these self-contained grace pills can be packaged and served up as answers to the complexities of life’s problems. Antidote reminds me that the line between icon and idolatry is one that can be crossed in any tradition. The "magical" quality some Protestant traditions assign to the words of scripture comes very close to bibliolatry, and a sacred fetish of words can quickly lapse into superstition that is not far off from the relic system of the Middle Ages. The Bible is not an answer book – at least not in sense that Roorda suggests through his pre-packaged proof-text vials. Roorda’s work reminds me that the Christian faith grew through story, not text. While the Bible must be held in the highest regard, its power is tied to the thrust of its good news. It is a story that tells us that Truth is a person to be known, not a collection of disembodied facts and aphorisms to be studied and prescribed as “good-for-what-ails-ya” tonics. Perhaps the burning of the text here is akin to the therapeutic idol-smashing of Hezekiah. It is only after the fetish is destroyed that the Bible as story can be recovered from the ashes as a subversive text: a text that often undermines our assumptions, complicates easy readings, and transgresses systematically-arranged boundaries. Paul Roorda: Antidote, Bible pages, ashes, glass vials, cork. Installation: 24 x 36 x 2 inches, 2006. Chris Cuthill has taught Art History at Redeemer University College in Ancaster, Ontario, Canada for the last ten years and has served as Chair of the Art Department for the last six. He teaches courses in Art Theory, Art History and Popular Culture. He has worked professionally in the theatre, as a graphic artist and as an art curator. A practicing artist, Cuthill has exhibited work in Canada, the United States and Europe; his favoured media are fabric and paper collage.